Big Island Country Club Hole 3: The end of the "easy" stretch of golf holes starting the round is a simple, straight par four at the top end of the property with nice mountain vistas. Big Island Country Club Hole 5: The course really starts to bare its teeth on this long par three with a creek to the left of the green and a deep bunker to its right. Back and left pins are especially tough. Big Island Country Club Hole 6: Starting with a drive over a deep bunker, the player can layup to the right or fly the bunker to leave the option of trying to get home in two. However, the green is indeed guarded by plenty of water to its right. Played as a three shot hole, it is a little more manageable. Big Island Country Club Hole 7: This nasty par four has water all the way down the right and the green is cut devilishly close to said pond, leaving a very tough approach from any angle. The bailout left will leave a delicate chip down the hill towards the water. Big Island Country Club Hole 8 (left): This is the classic Dye par 3 with water all the way down the right, culminating in a green snuggled against the hazard. To make matters worse, it is quite long, requiring a mid iron at best. Big Island Country Club Hole 9 (below): Another long par four, this one has a lake to the right waiting to gobble up the errant tee shot. The second shot is easier than it appears from the fairway as the water is not as close to the green as it looks, but as it is a long par four, that is little consolation. 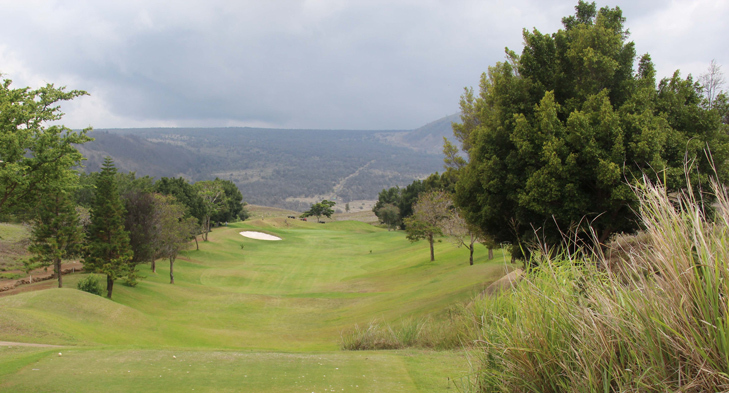 Big Island Country Club Hole 12: This reachable par five is only done at the peril of the golfer who is willing to cross a bunch of water with their second shot to a small green with a steep hill behind it. For the more sedate choice, the second shot is key as the layup is tight. 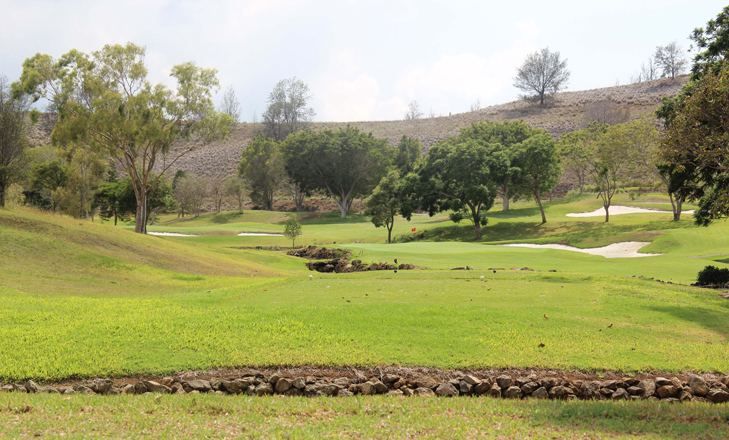 Big Island Country Club Hole 14: Relatively simple for this golf course, this uphill par four has a good driving decision. If the player wants a wedge into the green, they can fly the bunker to the left, but if they push the shot right, they'll be on the hillside. The layup drive is plenty wide, but leaves a tougher uphill approach. Big Island Country Club Hole 17: This island hole has a very close family resemblance to another more famous Dye 17th hole located in Florida. The green contours and location of the bunker are also strikingly similar. 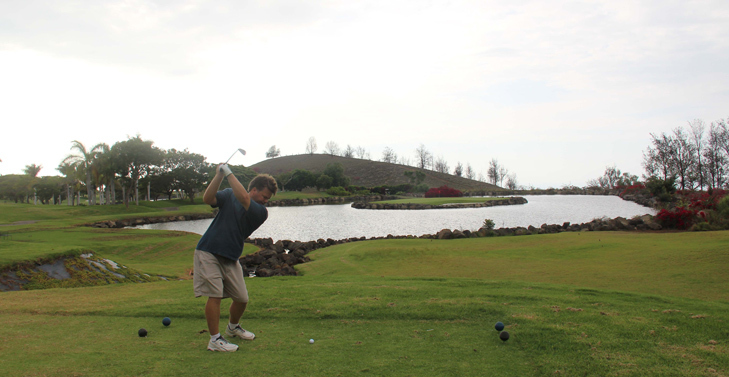 With the tradewinds blowing, this hole is enough to get the adrenaline pumping and make club choice critical. Big Island Country Club Hole 18: The last hole of the day is just plain mean. It is very, very long and requires a drive to stay left of the water, only to have to cross it and the other pond that is just left of the green. 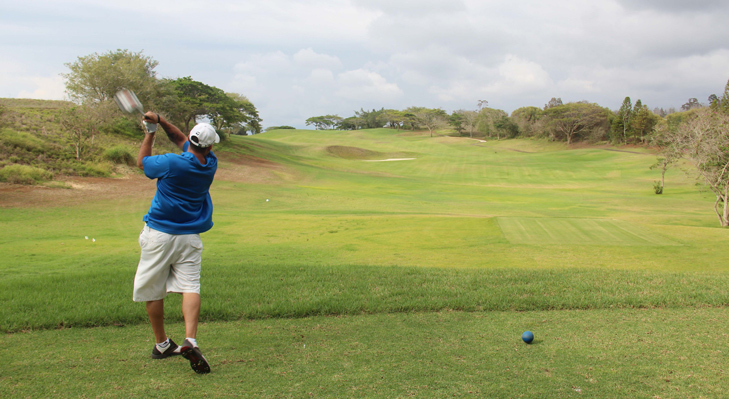 Whatever the golfer does, don't come to the 18th hole needing par for a career best round, as it won't likely happen.